AWS resources created for a worker environment tier include an Auto Scaling group, one or more Amazon EC2 instances, and an IAM role. For the worker environment tier, Elastic Beanstalk also creates and provisions an Amazon SQS queue if you don’t already have one. When you launch a worker environment tier, Elastic Beanstalk installs the necessary support files for your programming language of choice and a daemon on each EC2 instance in the Auto Scaling group. The daemon is responsible for pulling requests from an Amazon SQS queue and then sending the data to the web application running in the worker environment tier that will process those messages. If you have multiple instances in your worker environment tier, each instance has its own daemon, but they all read from the same Amazon SQS queue. The following diagram shows the different components and their interactions across environments and AWS services. Amazon CloudWatch is used for alarms and health monitoring. For more information, go to Basic Health Reporting. 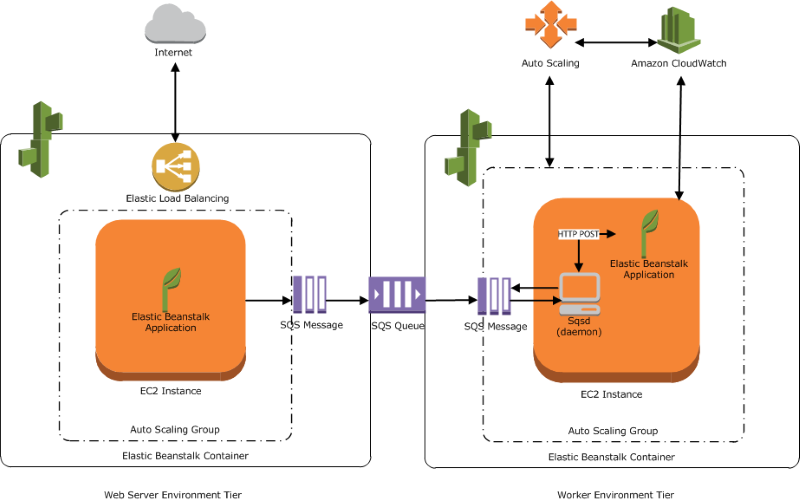 For details about how the worker environment tier works, see AWS Elastic Beanstalk Worker Environments.